As you step out of St Pancras International, a 16m high building wrap greets onlookers with a busy scene of celebration. Dining and drinking, dancing and singing, these characters welcome new arrivals at the station. The drawing is the work of world renowned illustrator, Quentin Blake. The piece was commissioned by Argent, London and Continental Railways and DHL-Exel Supply Chain, the developers of King’s Cross. It is the first of many public art initiatives intended for the scheme. Quentin Blake has illustrated over 300 books, but never a building. He was appointed the first Children’s Laureate in 1999 and made a CBE in 2005. Quentin Blake is one of the driving forces behind the idea to bring the UK’s first Museum of Illustration to King’s Cross. This Museum will celebrate historical and contemporary illustration as well as Quentin’s own work. The installation is mounted on the Grade II listed Stanley Building, one of sixteen Victorian structures on site. New development will embrace this heritage to create a new piece of city with a historic sense of place. The Stanley Building will be refurbished for new uses in due course. Adrian Mitchell died on December 20th. He was a natural pacifist, a great campaigner and, in his own words, 'a free-falling poet, playwright and writer of stories'. He believed that 'Most people ignore poetry / because / most poetry ignores people', and wanted his own poems, particularly those he wrote specifically for children, to live, dance, sing and fly - not be pinned out and dissected like dead beetles. On the day I went to interview Adrian I bumped into him on Hampstead Heath as he walked his dog Daisy, 'the peace dog'. Soon he'd introduced me to most of the other dogs and dog-walkers on the Heath that morning. 'Say hello to Daisy,' he was careful to say on each new encounter. He was a robust, gentle man ('dear good-natured Adrian,' Kenneth Tynan called him) who exuded enthusiasm. Gallery event: Shirley Hughes on Saturday 6th December. with Shirley Hughes here at the gallery tomorrow signing copies of her fantastic new fairytale Jonadab and Rita. There is also a chance to see some of Shirley’s fabulous original artwork which is featured as part of our current Winter Exhibition. Signed first edition books £9.99 - £45. and special signed editions of Where The Wild Things are by Maurice Sendak. Gilbert's The Little Book of Thunks: 260 Questions to Make your Brain Go Ouch! (Crown House Publishing) has won this year's Educational Writers' Award. The award is sponsored by the Authors' Licensing & Collecting Society (ALCS) and supported and administered by the Society of Authors. Gilbert received his cheque for £2,000 from Dr Ian Gibson MP at a reception at the Stationers' Hall, London. This year's award was presented for non-fiction published in 2006 and 2007 that enhanced teaching and learning for 12 to 18 year-olds. The judges described Gilbert's book as "a completely original book to get all ages stretching their imaginations, thinking, discussing cogently and debating… a valuable tool for the teacher”. Friday 19th December sees the release of a major Universal Pictures animated film based on Kate DiCamillo's Newbery Award-winning The Tale of Despereaux, starring Matthew Broderick as Despereaux, Dustin Hoffman as Roscuro, and Emma Watson as Princess Pea. There are also cameos from Sigourney Weaver, Tracey Ullman and Robbie Coltrane. The film version of Cornelia Funke's fantasy novel stars Helen Mirren, Jim Broadbent, Brendan Fraser, Paul Bettany, Andy Serkis and Sienna Guillory. The film will be playing in 500 British cinemas from Friday 12th December and is set for a massive media campaign including X-factor this weekend! A hard rain’s gonna fall? The economic slowdown has left town halls having to find more than a billion pounds of savings over the next three years to safeguard vital local services and keep council tax down, town hall leaders will say today. The Local Government Association, which represents over 400 councils in England & Wales, is warning that the grim economic climate and rising inflation is forcing councils to come up with new ways to make money go further and maintain normal services. New analysis shows that spiralling inflation has reduced the real terms value of money that councils receive in grant from the Government and through council tax. In real terms, the funding awarded to councils in last year’s Comprehensive Spending Review is now worth almost £500m a year less than the Government intended. Already, there are reports of cuts around the UK. The Highlands and Aberdeen have faced cost cutting to their Schools Library Service and Wirral has announced ‘reconfiguration’ of its library service. The Campaign for the Book was launched in part to remind councils of their responsibilities and to support campaigns against cuts to library services. Please contact the Campaign with your stories. We will do our best to provide speakers for meetings. I can announce the details of the Campaign for the Book summer conference. King Edward’s School, Birmingham B15 2UA. My thanks to school librarian Jean Allen who has secured the venue for us at a nominal rate. I am aware that the Conference is now scheduled only a week after the School Library Association’s weekend event on June 20th and 21st. I am afraid there was no other date at which I could get a venue at reasonable cost. Some establishments were asking for between £2,000 and £7,000! I would urge anyone going to the SLA event to come along to Birmingham the week after too. Bodies like the SLA and the Campaign for the Book share a very similar vision. Consider it a busy two weeks to take a stand on behalf of libraries and reading for pleasure. The two events will complement each other. One of the centrepieces of the conference will be a Question Time session on the future of libraries and reading. The following have already accepted an invitiation to speak: Roy Clare, MLA executive, Lyn Brown MP, Labour, all Party Parliamentary Group on Libraries, Ed Vaizey MP, Conservative speaker on Culture. I am awaiting final confirmation from the Liberal Democrats and from leading authors who will join the debate. I will announce the remaining list of speakers once they have all confirmed. I would urge everyone in the Society of Authors, Cilip, YLG, SLA, the National Literacy Association, the National Association for Primary Education, the public service trade unions and publishers and the many individuals who have supported the Campaign to circulate the details of the Conference as widely as possible. I believe it can become a focus for debate about the future of libraries and books, supporting all the other groups and individuals who share our love of reading. 1) Supporters circulate this newsletter as widely as possible. 2) Organizers issue the first leaflet advertising the Conference just after Christmas. Illustrator Steve Weatherill has kindly agreed to provide a cartoon for the first leaflet. Each month I will be asking an illustrator to design a different leaflet to sustain the momentum. 3) Final confirmation of speakers. 4) Collection of delegate fees. This will be set at the lowest level possible and include coffee, tea and a lunch. At the moment it looks likely that the cost will be very low indeed. Most speakers have already indicated that they will attend for the nominal cost of travel only and accommodation if at long distance. My thanks to them for that. 'He is often asked if he really believes that his novels are suitable for young readers, and even sometimes whether the books he writes especially for them have entirely suitable themes. "My advice is this. For Christ's sake, don't write a book that is suitable for a kid of 12 years old, because the kids who read who are 12 years old are reading books for adults. I read all of the James Bond books when I was about 11, which was approximately the right time to read James Bond books. So you work out this kind of little equation in your head and you think, yeah, like Nation – the one that's just come out – that's a book for kids. And people will say: 'Well it covers very adult subjects ...' Yeah, that's why it's a book for kids. Because you want kids to grow up to be adults, not just bigger kids." People are still signing up to the campaign against putting ages on books ...the total now stands at an impressive 4670. However some publishers are now putting ages on books - but all publishers say they will not put an age on a book without the specific agreement of the author. Anthony Horowitz will present the Marsh Award for Children’s Literature in Translation 2009, at a ceremony at the English-Speaking Union, on 20th January 2009. The Award of £2000 will go to the winning translator. The Marsh Award for Children’s Literature in Translation was designed to spotlight the high quality and diversity of translated fiction for young readers and is presented biennially. Since its inception, in 1996, there has been a steady increase in the number of children’s books translated into English and published in Britain. For the current award the list of submissions has increased substantially and includes books translated from Chinese, Danish, Dutch, French, German, Greek, Icelandic, Italian, Spanish (including an entry from a Cuban author), Swedish and Yiddish. The judging panel was excited by the high quality of submissions and after animated discussion, have selected six excellent stories, all beautifully told. Borders UK has agreed to work with publishers to promote the shortlist throughout all their stores in January 2009. This is a rich and diverse shortlist. Some of the books give an insight into other cultures, others have a mind-stretching sense of place or time and all of them are great stories, reminding us that some of the best children’s books can come from beyond our shores. · Wendy Cooling – Book Consultant, author and critic. The award is administered by the English- Speaking Union and sponsored by the Marsh Christian Trust. This interview links to the article on "We are all born free" in the current edition of Carousel. Do listen. Monday 3rd November Libby Purves will talk to Jane Ray and Dan Jones from Amnesty about We Are All Born Free. The interview will be live during the programme which goes out 20.30 – 21.00 and is repeated Sunday 9th November 23.00 – 23.30 . "CILIP supports the aims of the “No to Age Banding” campaign. It believes that the age banding of books is unhelpful and potentially harmful to the enjoyment of reading by children" Visit www.notoagebanding.org for the full statement from the librarians. Opens next week Wednesday 1st October! There will be new work on display by all of the illustrators listed above. Don't miss this wonderful opportunity to meet, chat and have your books signed by some of the most talented illustrators around! 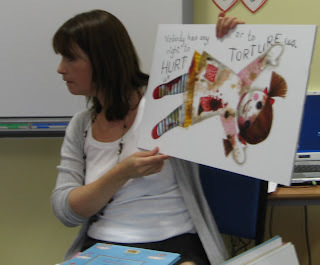 Jane Ray talking to children at Saxmundham Primary School, Suffolk as part of a series of workshops leading to a school art exhibition during the Halesworth Arts Festival. Jane has contributed a very moving and compelling image for the book. 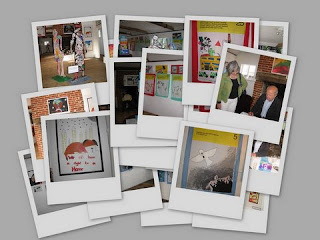 The exhibition will be opened by John Burningham, who has contributed to We are all born free , on Saturday 11 October and the exhibition will be open every weekend throughout the festival (11 October to 26 October). The splendid publication is published on 9 October by Frances Lincoln. There will be an article about this important book in the next edition of Carousel. The Illustration Cupboard is one of those rare galleries that actually welcome children. Do grab the chance to see the original illustrations for The Church Mice by Graham Oakley...a real pleasure for us who remember them first time around and a joy to come for those who have yet to discover them. Celebrating the new edition of this much-loved classic story. The way I see it, by Nicole Dryburgh (Hodder Children’s Books) - a teenager’s own story of her fight to rebuild her life after cancer. Aged 11, Nicole was diagnosed with a malignant tumour on her spine and after a brain haemorrhage at 13 which left her blind she was expected to live for only weeks. Now 19, Nicole - still blind, unable to walk and losing her hearing - is always busy, whether writing, fund-raising, travelling, or socialising with friends. “An inspiring story of a positive young lady and her fight against cancer,” was one reviewer’s verdict. Relaunched this year, the YoungMinds Book Award 2008 will be given to a book for readers of 12 + which helps young people to cope with the challenges of growing up. The panel of judges will now choose the winner of the £2000 prize, to be presented at a gala ceremony at the Unicorn Theatre, London, on Monday November 17, following the YoungMinds Annual Lecture. Becky Stradwick, senior buyer for children’s books, Borders. The Roald Dahl Funny Prize is the first prize of its kind; founded to honour those books that simply make us laugh. The winner of each category will receive £2,500, which will be presented at an awards ceremony in London on 13 November. Places go fast, so please book early! Sky1 has signed up Oscar nominees Tim Roth and Kelly MacDonald as well as Life on Mars star John Simm for its new feature-length drama Skellig. The 120-minute "modern fairytale", which is based on David Almond's Whitbread Children's Award-winning novel, is the first project to commence production from Sky1's new £10m-plus drama investment fund. Filming began today on location in Cardiff on the high-definition drama, which will also star Son of Rambow child actor Bill Milner. A groundswell of political opinion is growing in support of the campaign aims and all three parties are engaged with it now. At the recent Showcomotion conference (2 – 4 July, Sheffield) Ed Vaizey MP Conservative Shadow Minister of Culture and Broadcasting gave a Keynote address. Visit www.showcommotion.com for further information. You can still lend your support to this campaign by signing up at http://petitions.pm.gov.uk/kidstelevision/, increase the political pressure by emailing a letter drafted by PACT to your local MP: http://pact.co.uk/campaign/ or attend the Voice of the Listener and Viewer’s annual conference in November (see events listings). Costa judges - children wanted! Random House Children’s Books and Thomas Cook are delighted to announce a joint initiative which will lead to the introduction of Reading Zones into all Thomas Cook resorts that feature club: KidsWORLD. The Reading Zones will be jam-packed with favourite books from leading children’s authors and they offer great chill out zones for children on holiday. To mark this new and exciting relationship two author weeks will launch the project this summer. Authors Steve Cole and Janey Louise Jones will be taking their Astrosaurs and Princess Poppy events out to Thomas Cook holiday resorts in Majorca. Steve Cole has just got back from his tour of the resorts on the island where he introduced over two hundred children to his Cows In Action and Astrosaurs books. Best-selling author Janey Louise Jones will take a trip to the Balearic Island this August where children will be treated to Princess Poppy party games and book readings from the author. This September, Bath will be buzzing with children’s book authors and illustrators for the second Daily Telegraph Bath Festival of Children’s Literature 2008. Chill out with a visit to Bath Central Library for this fantastic exhibition of artwork from leading children’s book illustrators and get The Big Picture in this National Year of Reading. With work ranging from that of world-known Babette Cole, author/illustrator of beloved classics Princess Smartypants and Mummy Laid an Egg, to that of brand-new book illustrator, Paula Bowles, over 30 artists are represented in a colourfully diverse and diverting show. The illustrators featured are largely locally-based but internationally-employed. They are Grahame Baker Smith, Paula Bowles, Tim ‘Willy’ Bullock, Ivana Svabic Cannon, Michelle Cartlidge, Margaret Chamberlain, Babette Cole, Frances Cony, Steve Cox, Christina de la Mare, Kate Davies, Richard Deverell, Chris Fisher, Mary Hall, Penny Ives, Simon James, Peter Malone, Rodney Matthews, Jackie Morris, Jan Nesbitt, Graham Oakley, Tessa Norris, Anna Popescu, Katy Rhodes, John Sibbick, Sue Shields, Suzy-Jane Tanner, Alan Snow, Carol Tratt, Sarah Warburton, Nadine Wickenden. Original works, cards and prints are available to buy and you can meet the illustrators themselves during the exhibition. For the latest gen on who and what’s on show visit SWILL’s blog www.swillustrators.blogspot.com or ring 0117 9730022. Staged in association with The Daily Telegraph Bath Festival of Children’s Literature (www.bathkidslitfest.co.uk), National Year of Reading (www.yearofreading.org.uk) and The Big Picture (www.bigpicture.org.uk). We are delighted to receive sponsorship from Hodder Children’s Books, Orchard Books and Templar Publishing. Sometimes it just isn't good enough for a writer to sit in his or her study tapping out the latest novel. Events recently propelled me into a fortnight of frantic activity that made me sit down and think very carefully about the position of the book in society. The trigger was an invitation to speak at a public meeting in Doncaster, South Yorkshire to protest against swingeing cuts to the town's library service. According to the public sector union Unison, Mayor Winter's administration is proposing savings of £662,000 and a further £268,000 being put aside to pay for redundancies. In all some thirty staff are earmarked to go. There will also be cuts to the book budget and to opening hours. On my return home, I fired off an open letter protesting against this butchery to the many writers, educationalists and librarians I had encountered at the 150 public speaking engagements I do every year. The response was instantaneous. The signatories are too many to list here but they included Philip Pullman, Philip Reeve, Michael Morpurgo, Geraldine McCaughrean, Toby Litt, Anne Fine, Mark Steel, Beverley Naidoo and dozens of others. Many contributors to the statement included personal testimonies to the importance of public libraries in their own professional journeys. The statement figured in the Doncaster press and produced much hand-wringing in the corridors of power. Indeed, Mayor Winter wrote to me this week, responding to the statement. His letter denied that there was any wide-scale cost-cutting at all. This gave an extra fillip, if one was needed, to the several hundred strong demonstration by librarians and their supporters through Doncaster town centre on Saturday, July 12th. At the rally, author Helena Pielichaty and I spoke. But my concerns go wider than just Doncaster, dire though the situation is. Many of those who emailed me told me of similar situations in their own areas. To cap it all, on Thursday, July 10th at the Kids' Lit Quiz Final in Oxford, I was told by a librarian, a leading member of the Federation of Children's Book Groups, that she faces a £7,000 pay cut. I was appalled to discover how a local authority could treat someone with vast experience and expertise. In conclusion, recent events acted as a flash of lightning which illuminated the current landscape in the world of books. Libraries are under threat. Some sixty closed last year. The numbers of professional library staff fell in the decade 1995 to 2005 by 13%. National book expenditure in libraries is at its lowest level since 1995. Nor is it just public libraries. Everywhere, there is a shift from the book to computer services. In some schools the library has been closed, only to reopen as an IT suite. And the books? They have been boxed up and locked in a cupboard somewhere. School librarians have been dismissed and don't forget, only 28% of schools had qualified staff in the first place. Finally, in both public and school libraries, there is a shift from qualified staff to untrained volunteers. In my opinion, this amounts to nothing less than an undeclared war on the book. I would propose a national conference to set up an umbrella body including everyone who wants to preserve the place of the book in the life of the UK. The country has plummeted down the international PISA ratings for children's reading, a scandal when we remember the UNESCO report that concluded that reading for pleasure is a more important indicator of educational achievement than social class. The conference would include the main professional bodies such as CILIP, the SLA, the Society of Authors, the Poetry Society, the teaching and public sector unions, children's book magazines such as Carousel, Books for Keeps and Armadillo and the country's novelists, illustrators and poets. The aim would be to draw up a brief, popular, commonly agreed charter to defend the place of the book in our national life. Hopefully, it could also produce a free book full of accounts from people in public life together with poems, stories and snippets about the importance of reading. This may sound a very ambitious undertaking but, despite the marvellous Year of Reading, everywhere I go reading for pleasure faces significant challenges. There are sharks circling in the water. It is time to make a splash and drive them away. "Max and the Doglins" by Amanda Montgomery Higham is the winner of the third "Read it Again!" Cambridgeshire Children's Picture Book award. Amanda was presented with the award by last year's winner Tim Hopgood at a special presentation ceremony in front of 230 children at the Burgess Hall, St Ives in Cambridgeshire on Thursday 26th June. The award is for a debut picture book where the story and pictures are the work of one person. The Award Ceremony at the British Library on Thursday 26 June was compared by Bob (I didn't catch his last name) who is head of CILIP. His style is very much jacket off, sleeves rolled but despite a jokey manner he made a worth while plea for local authorities to maintain their expert children's librarians. Michael Portillo presented the prizes and showed convincing interest throughout the ceremony. Join Charlie and Lola, Clarice Bean and friends in an interactive summer exhibition for under 7s and their families. Sit at Charlie and Lola’s kitchen table and make meals with food from their fridge. Dress-up in Charlie and Lola’s favourite outfits including Lola’s fabulous alligator costume from I Am TOO Absolutely Small For School. Draw imaginary friends on a magna-doodle (inspired by Lola’s friend Soren Lorensen). Visit Grubby Alley where That Pesky Rat lives. Perform puppet shows to an audience of family and friends (in a theatre created from the four-poster bed in The Princess and The Pea). You can also see over 40 original illustrations from Lauren's award-winning stories. And have an exclusive first peek at the author's next book. Green Drops and Moonsquirters is the very first exhibition to be dedicated to Lauren Child's work. Her illustrations artfully combine drawing, collage and photography while witty and irreverent text weaves through the pages in unconventional ways. Curated and developed by Manchester Art Gallery, the free exhibition premieres at the gallery from 21 June until 21 September 2008 before touring to museums and galleries around the UK. Supported by the Arts Council England. …I’m all for keeping book buyers informed. That’s what reviews and the reviewing media are for (not least this very journal). Where books for children are concerned, with choosers who may well be someone other than the intended reader, a bit of preliminary reconnaissance is especially helpful. That’s where the blurb on the book itself comes in – not to mention the hard-to-miss signals provided by the lay-out of the pages, the size of the print, the style of the illustrations and a sampling of the actual text. With evidence like this as a guide there’s nobody, so far as I know, who has ever confused the intended readership of, say, THE HOUSE AT POOH CORNER with that of TREASURE ISLAND. Why, then, are publishers now insisting that all children’s books carry a prominently displayed ‘age-band’ to indicate that a particular title is for readers of 6+, or 9+, or 12+ or, in the case of Adrian Mole perhaps, 13 ¾? Getting a ‘fix’ on a book is one thing. Getting a Kwik-Fix is entirely another. For me that settles it. Well do I remember, for instance, my first encounter with TREASURE ISLAND. As a ten-year-old, I was equally impressed with the half of it I understood and the half of it I didn’t. Much more puzzling was THE HOUSE AT POOH CORNER which I came across at about the same time. How could such a ‘baby’ book make me laugh so much? If the first had been banded at 12+, say, and the second at 6+, I’m pretty sure I’d have rejected both. As it was, I was happy to find out for myself if these were books for me...because neither of them made me feel unwelcome. The Society of Authors has called for age-guidance plans to be temporarily suspended pending a review, following the unprecedented author revolt last week. Novelist Celia Rees, chair of the children’s writers and illustrators group at the Society of Authors, told the Bookseller that if publishers go ahead it should only be with individual authors’ approval. “Not all writers are against age guidance, but given the strong opposition that has emerged in recent days, we have proposed to the Publishers Association that the Children’s Book Group’s plans should be put on hold, pending a review, which would include a number of authors,” she said. A spokesperson for the CBG said that publishers were continuing to discuss author concerns on an individual basis. “Publishers are getting lots of valuable feedback from authors, which in turn is helping them address the specific issues and concerns that authors are raising. The CBG remains committed to the principle of age guidance, which it sees as one of several tools that will help more adults choose and buy a book for the children in their lives.” Walker and Usborne said that they were among those playing a “wait and see” game. Usborne, said that publishers were “never as united as the first statements indicated”. Whilst Walker has indicated it is in “no hurry” to join the age guidance movement. Hurrah! A children's book wins a children's book award...so many short listed books for Children's Book Prizes seem to be for teenage books. Siobhan Dowd’s The London Eye Mystery (David Fickling) was named Bisto Book of the Year 2007/08 at a ceremony in Dublin last week. The author died of cancer last year, and the trophy and cheque for €10,000 were ac­cepted on her behalf by her friend and publisher, David Fickling. Siobhan's husband Geoff Morgan was also at the ceremony and the prize money will be donated to The Siobhan Dowd Trust www.siobhandowdtrust.org. We are writers, illustrators, librarians, teachers, publishers and booksellers. Some of us have a measure of control over what appears on the covers of their books; others have less. Each child is unique, and so is each book. Accurate judgments about age suitability are impossible, and approximate ones are worse than useless. Children easily feel stigmatized, and many will put aside books they might love because of the fear of being called babyish. Other children will feel dismayed that books of their ‘correct’ age-group are too challenging, and will be put off reading even more firmly than before. Age-banding seeks to help adults choose books for children, and we're all in favour of that; but it does so by giving them the wrong information. It’s also likely to encourage over-prescriptive or anxious adults to limit a child's reading in ways that are unnecessary and even damaging. Everything about a book is already rich with clues about the sort of reader it hopes to find – jacket design, typography, cover copy, prose style, illustrations. These are genuine connections with potential readers, because they appeal to individual preference. An age-guidance figure is a false one, because it implies that all children of that age are the same. Children are now taught to look closely at book covers for all the information they convey. The hope that they will not notice the age-guidance figure, or think it unimportant, is unfounded. Writers take great care not to limit their readership unnecessarily. To tell a story as well and inclusively as possible, and then find someone at the door turning readers away, is contrary to everything we value about books, and reading, and literature itself. To sign up and show your support for this statement, send an email to signup@notoagebanding.org . We will publish your name and any relevant description (eg writer, bookseller) on this web site and possibly in the Bookseller advertisement. We'll keep your email address confidential and won't pass it to anybody else, but we may write occasionally with relevant news. Derek Landy’s debut novel, Skulduggery Pleasant, has won the Red House Children’s Book Award (RHCBA) - the only national children’s book award to be chosen exclusively by children. The category winners were in the Books for Younger Children section, Polly Dunbar with Penguin published by Walker Books and in the Books for Younger Readers Chris Riddell Ottoline and the Yellow Cat published by Macmillan Children’s Books. Derek Landy won the Books for Older Readers as well as being awarded overall winner. · The Red House Children’s Book Award, now in its 28th year, is the only national award 100% selected by children – that includes both the shortlist and the winners. · It’s totally democratic & accessible - any child can take part and vote via the website www.redhousechidlrensbookaward.co.uk or via a Freepost address. Listed in one of those free book magazines - May edition of Booktime to be precise - is a list said to be from The Mammoth Book of Boys' Own Stuff. I haven't checked it out BUT the list is headed "Ten Books to Read Before the Age of Ten" and includes Coral Island, The Call of the Wild and Treasure Island!! 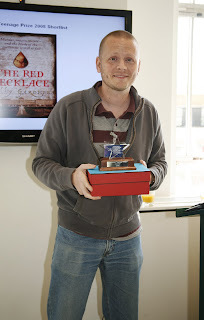 Author Kate Cann has won the 2008 Angus Book Award for her novel Leaving Poppy, Lewis Miller, Chair of the Angus Youth Congress, presented the winning author with her trophy, a miniature replica of the Aberlemno Serpent Stone, and £500 prize at a ceremony in Montrose Town Hall on 20 May. After several months of decision making and debate in the eight Angus secondary schools, the five shortlisted authors arrived from all over the UK to speak to the pupils and take part in the award ceremony in Montrose. The ceremony, organised by 3rd year pupils, was hosted this year by Montrose Academy. Pupils from the other secondary schools spoke about the shortlisted books and asked the authors questions. This year’s voting was again a close run race but the reaction of the pupils to the announcement of the winner confirmed that this was an extremely popular choice. The other shortlisted authors for the 2008 award were: Sherry Ashworth for Close-up (Simon & Schuster UK)), J. A. Henderson for Bunker 10 (Oxford University Press), Graham Marks for Omega 10 (Bloomsbury) and Anthony McGowan for Henry Tumour (Definitions). Leaving Poppy is a taut, tense ghost story with a chilling edge, published by Scholastic. It tells the absorbing story of Amber who has fled from her claustrophobic, manipulative family, determined to start her life again in a different town, only to discover that her new home hides a horrifying, terrible secret. When circumstances bring her suffocating sister Poppy to live with her again, a latent power concealed in the house is awakened. The book raises the question, which is more frightening - the supernatural or the selfish, destructive family? Next week’s Bedtime Stories on the CBeebies Channel will be read by the Children’s Laureate Michael Rosen. Michael has chosen five of his favourite children’s books to read – Ruby Sings the Blues (Niki Daly), Eliza and the Moonchild (Emma Chichester Clark), Farmer Duck (Martin Waddell), The Opposite (Tom Macrae) and Slinky Malinki Catflaps & Hairy Maclary of Donaldson’s Dairy (both by Lynley Dodd). Bedtime Stories are produced by Angela Young for CBeebies Presentation. You can see Michael reading the stories from May 19th – 23rd on the CBeebies channel at 6.45 pm. Ruby Sings the Blues and Eliza and the Moonchild will both be repeated on Saturday 24th and Sunday 25th at 6.45 pm. Original claymation models and documentary film will also be on view. The Roald Dahl Funny PrizeBooktrust, in association with Children’s Laureate Michael Rosen, is delighted to announce the inaugural Roald Dahl Funny Prize. This exciting new prize has two categories – the funniest book for children aged six and under, and the funniest book for children aged seven to fourteen. Fiction, non-fiction and poetry will be welcomed. A panel of five judges will be chaired by Michael Rosen; the other judges are Sophie Dahl, Dara O'Briain, Chris Riddell and one other. The judges will select a shortlist of six books in each category in early September to tie in with the third Roald Dahl Day on 13 September. The winner of each category will receive £2,500, which will be presented at an awards ceremony in London in November 2008. 'If there had been a prize for funny books when Roald Dahl was writing, he would have won it with every book he wrote! That’s why this award was named in his honour. > promote laughter and humour as a feel-good factor when reading, by encouraging families to read together and discover the pleasure of humorous (funny) books. This in turn will reinforce the message that reading together promotes family well-being. > draw attention to funny books as readable and enjoyable books. We hope that the prize will enable these books to gain a profile that makes them more accessible to children and young people. The prize will work to achieve this through a range of activities supported by libraries, teachers and parents. > reward and encourage authors (and illustrators) who write and illustrate books using humour in their stories, poetry and fiction. By creating these awards we hope to promote a vibrant area of publishing often overlooked by other awards. The winners will be announced in Aberdeen on November 18 2008. The Awards, given by the English Association, will be presented to the winners on Wednesday 21 May 2008 at 5.00pm at the British Academy, 10 Carlton House Terrace, London, following the Association’s AGM. * Kevin Crossley-Holland, shortlisted for Gatty's Tale, has won before for Storm in 1985. * Linzi Glass is shortlisted for Ruby Red, her second novel. She was brought up in South Africa and now lives in California. * Tanya Landman is shortlisted for Apache. This is the first time she has been shortlisted for the Carnegie. She lives in Devon with her family. * Elizabeth Laird's Crusade is her fifth book to be shortlisted for the CILIP Carnegie. * Philip Reeve, shortlisted for Here Lies Arthur, worked in a bookshop before writing his first book, Mortal Engines. * Meg Rosoff is shortlisted for What I Was, her third novel. She won the Carnegie award last year for Just in Case. * Finding Violet Park is Jenny Valentine's debut novel which has already won the Guardian Children's Fiction Prize. Walker Books - will he win it for an unprecidented third time? You will find interviews with many of the shortlisted authors and illustrators in back issues of Carousel. And an interview with Polly Dunbar will appear in the Summer copy of the magazine. Four authors who live in and around Somerset have collaborated to create a promotional poster to mark the National Year of Reading. Lynne Benton, Rebecca Lisle, Sue Purkiss and Kathryn White feature on a poster which they are distributing to local schools and libraries, promoting their books and websites, and their availability for talks and workshops. Anya Hollis, Marketing Director of Walker Books welcomes the move. "We are very happy to work collaboratively with our authors, and in particular to help spread the word about Sue, her new book The Warrior King and her backlist." The UK’s Best New Illustrators were revealed today by Children’s Laureate Michael Rosen at the Children’s Book Fair in Bologna. The final ten represent the best rising talent in the field of illustration today, who demonstrate remarkable creative flair, artistic skill and boundless imagination in their work. The final ten were chosen from over 250 published illustrators by an illustrious Booktrust panel. To be eligible, illustrators must have been published in the UK since 2000. The Big Picture Judging Committee comprised author and illustrator Anthony Browne; Sunday Times journalist Nicolette Jones; Antonia Byatt, director of literature strategy at Arts Council England; author Malorie Blackman; and John Huddy founder of the Illustration Cupboard. The Best New Illustrators form part of the Big Picture campaign, which has events running throughout 2008. As well as the Best New Illustrators, Booktrust and Rough Guides have produced The Rough Guide to Picture Books which will be distributed free of charge by branches of Tesco and Waterstone’s. The Big Picture will also join up with the Campaign for Family Learning and The Big Draw to host Big Picture parties at libraries throughout October, to celebrate picture books and encourage family reading through drawing. The exhibition of works by the ten Best New Illustrators will run at the Illustration Cupboard, Piccadilly, London from 17 April – 3 May. The Siobhan Dowd Trust is the dying bequest of the celebrated children’s author Siobhan Dowd. Just before her tragic death from cancer in August 2007 she personally and energetically supervised its foundation, to support, in all ways possible, disadvantaged young readers in the UK and Ireland. It was one of the very last things on Siobhan’s mind and clearly for her the most pressing cause in our society today. To take stories to our children without stories. To bring the joy of reading to our children deprived of reading. To bring books to our children deprived of books. To fund disadvantaged readers where there is no funding, and to support disadvantaged readers where there is no support. To fund and support any persons or organizations who help disadvantaged young readers. The Trustees believe that the best and truest way faithfully to observe Siobhan’s last wish is to invite applications from persons or organizations in the UK or Ireland who need funding to directly help disadvantaged young readers. The Trustees will take a few months to consider and evaluate applications and then begin to disburse awards in the way that best seems to follow Siobhan’s wishes. By the terms of Siobhan’s will, all royalty income derived from her published novels and any posthumously published work will go to the Trust. The Trustees believe that Siobhan’s generosity will be the seed of something much larger, and so the Trust also welcomes donations from the public. The aspiration is to help as many disadvantaged young people as possible. The Trustees are in no doubt of the importance of this bequest and its fundamental urgency for our children and for the future culture of the British Isles and Ireland. We may think we live in a literate society but, as Siobhan was well aware, there are too many places in our own ‘house’ where children are denied the opportunity to read. This is a charity that must begin at home, a home that, like Siobhan’s life, spans both sides of the Irish Sea. A brief note on Siobhan: Siobhan spent most of her career looking after writers. Working for PEN she fought to help writers silenced by oppressive regimes around the world. Closer to home, she did all she could to get reading material into the hands of disadvantaged young people from all walks of life, for example encouraging people in young offenders’ institutes to read, and youngsters from the Romany culture to record their history. Her support for, and encouragement of, her fellow-writers was inexhaustible. In some ways perhaps she sacrificed her own brimming talent for the benefit of other authors. And then, just as she discovered she was fatally ill, she put pen to paper and produced four of the most remarkable novels for children you could wish for. She was a writing phenomenon. The overriding thought of all those who knew her work is that her loss to the world of children’s writing is a tragedy. It is utterly characteristic that Siobhan should, at the end, put her mind unerringly to the most deserving group of all: the young reader. Siobhan realized that our literary culture - critics, bookshops, agents, publishing, libraries, schools - depends ultimately on the reader. And, of readers, the young reader is the most vulnerable. And amongst young readers, the disadvantaged young reader is the most deprived of all. Siobhan, at the last, and with all her usual clarity, decided to help them. And you can help them too. Born to Dance by Katherine Reynolds published by Ideasa4writers has won the Children’s category in one of the David St. John Thomas Charitable Trust Awards. These awards are run in conjunction with Writers News and Writers Magazine. Born to Dance now goes on to try for the overall prize, competing with fiction for adults, non-fiction etc. We' are a small group of her friends, family and colleagues who are planning a series of five lectures, spread over five years, to be delivered by various distinguished speakers with an interest in children's books. Some of the speakers may be authors themselves; all, from their different perspectives, will provoke thought. In this way and in Philippa Pearce's honour, we seek to acknowledge and understand excellence in writing for children, and to emphasize its continuing vital importance. On 11th September 2008, at Homerton College - an institution with which she was always happy to be involved - the inaugural lecture will take the form of a direct tribute to Philippa Pearce's work. Subsequent lectures will range more widely, over the works of others, but will tend to reflect her own wide-ranging literary interests in, for example, the short story, the ghost story, the picture book and, of course, the novel. Début author Sally Nicholls has scooped one of the most valuable and prestigious children’s books awards in the country at the age of just 24. Sally, a graduate of the Writing For Young People MA at Bath Spa University, was just 23 when she wrote Ways To Live Forever, a powerful, inspiring and courageous story told in the voice of 11-year-old Sam, who is terminally ill with leukaemia. Ways To Live Forever was announced as the winner of the Waterstone's Children's Book Prize 2008 by Children’s Laureate Michael Rosen in an evening ceremony at Waterstone’s Piccadilly on 13th February. As well as a £5,000 cash prize, Sally receives the promise of ongoing commitment from Waterstone’s 325 nationwide branches. Beating off stiff competition from a nine-strong shortlist, Ways to Live Forever is set to be the début of the year -- foreign rights have already been sold in seventeen countries and rave reviews have been flooding in. "It’s easy to see why the judges of the Waterstone’s Children’s Book Prize 2008 were hooked by Sally Nicholls’ début. Ways To Live Forever is a deceptively simple yet heart-wrenching story of a young boy dying of leukaemia, handled with grace and rare humour. Nicholls largely avoids mawkishness or sentimental set pieces. Yet readers can’t help but fill in the blanks and despair. Having deftly dodged the pitfalls of carrying such a weighty story, Nicholls is poised to follow in the footsteps of her favourite authors Hilary McKay, Frank Cottrell Boyce and Philip Pullman." Sally Nicholls said: “I am so excited to have won the Waterstone's Children's Book Prize. The experience has all felt very surreal, not just having my first novel published, but hearing how much my book has affected and moved the judges. There were some amazing novels on the shortlist, so it’s a real honour to have won”. Sally Nicholls was born in Stockton in 1984. Tragically, she lost her father when she was just two years old. She spent most of her childhood immersed in books, and dreamt of becoming an author from a young age. After graduating in Philosophy and Literature at Warwick, she took and MA in Writing For Young People at Bath Spa University, where she won the prize for the writer who showed the most potential. Sally is a practicing Quaker and a member of the Society of Friends and loves the theatre and reading - especially the works of Sartre, Kafka and Dostoevsky. She now lives in London and is writing her second novel, based on the pagan myth of the green man. The Midnight Hunter is due for release in January 2009. Ways To Live Forever is a scrapbook of lists, stories, pictures, questions and facts put together by 11-year-old Sam. He’s a boy who collects facts and loves looking things up on the Internet. He’s curious about ghosts and UFOs - and also death. Sam has terminal leukaemia. He is going to die. And dying is a fact of life. His unsentimental view of living and dying sweeps aside our fears of death, and the pure, clear voice in which Sally Nicholls tells his story also speaks of the discovery of an astonishingly accomplished and powerful young writer. The Children's Writers and Illustrators Group of The Society of Authors are holding a conference at Robinson College, Cambridge over the last weekend in August - 29-31 August 2008. Booking for this is now open to non-members. The conference is intended as a forum for the exchange of ideas for published and would-be published authors and illustrators but also for those interested in the whole children's book world. The conference opens on Friday evening 29 August and closes mid-afternoon on Sunday. Speakers include David Almond, Laurence Anholt, Anthony Browne, Polly Dunbar, Julia Eccleshare, Nicolette Jones, Graham Marks, William Nicholson and the Children's Laureate Michael Rosen. There will also be parallel sessions dealing with (on the whole) more practical matters including how to survive school visits, working in remote areas with indigenous communities in Australia, how to manage time, how to make a living as a children's poet, story-boarding, from picture book to film, historical research and more. Robinson College is a modern college set near the Backs so walking into the centre of Cambridge is a joy - a ten minute stroll alson a footpath takes one directly to King's College. Robinson opened in 1981, built to a high architectural standard with specially commissioned John Piper windows magnificently displayed in the chapel. The standard of catering is excellent and if the weather is glorious you can take your breakfast or lunch outside. Rarely, for a Cambridge college, you can walk on the grass. Ensuite accommodation with the lecture theatre, dining hall, exhibitions, Heffer's conference bookshop and bedrooms within the same central area. There are quick frequent trains from London to Cambridge and if you choose to drive there is even parking! Further details and a booking form can be seen on www.societyofauthors.org. Residential rates for the whole weekend for members of The Society of Authors are £255 plus VAT total £299.62 and for non-members £295 plus VAT total £346.62. Non-residential rates for the Saturday and Sunday only are for members £160 plus VAT £188 and non-members £200 plus VAT £235.